UC San Diego researchers have developed a test to screen for pancreatic cancer in a drop of blood. Pancreatic cancer is expected to become the second deadliest cancer in the United States by 2030. It is tough to cure because it is usually not discovered until it has reached an advanced stage. But a new diagnostic test developed by researchers at UC San Diego shows promise for detecting the disease earlier. The test, which is at the proof-of-concept stage, can rapidly screen a drop of blood for biomarkers of pancreatic cancer. It can provide results in less than an hour. The findings were published recently in the journal ACS Nano. Blood tests for early cancer detection, known as liquid biopsies, are a hot topic in research. They have the potential to detect cancer early on without having to do invasive surgical procedures like tumor biopsies. To screen for pancreatic cancer in the blood, researchers are developing new methods that involve collecting and analyzing nano-sized biological structures called exosomes, which are released from all cells in the body, including cancer cells. Exosomes contain proteins and genetic material that can serve as biomarkers for detecting cancers. But because exosomes are so tiny and fragile, they are hard to isolate from blood. Current methods to extract exosomes are time-consuming and require that blood samples be pretreated or diluted prior to use. Lewis worked on this project as part of a cross-disciplinary collaboration between nanotechnology researchers at the UC San Diego Jacobs School of Engineering and clinicians at Moores Cancer Center at UC San Diego Health. The collaboration is led by Michael Heller, professor emeritus of nanoengineering at the UC San Diego Jacobs School of Engineering, who is now at Oregon Health & Science University’s Knight Cancer Institute. The test is simple. Apply a drop of blood on a small electronic chip, turn the current on, wait several minutes, add fluorescent labels and look at the results under a microscope. If a blood sample tests positive for pancreatic cancer, bright fluorescent circles will appear. “This test could be used as a primary screening strategy to identify patients who would subsequently need to undergo more expensive and invasive diagnostic methods like a CT scan, MRI or endoscopy,” said Dr. Rebekah White, surgical oncologist and associate professor of surgery at Moores Cancer Center. The chip used in this test works by applying an alternating electric current, which selectively pulls nano-sized particles like exosomes out of the blood and deposits them onto tiny electrodes on the chip’s surface. Larger blood particles get washed away while smaller ones such as exosomes are left behind. Researchers then apply fluorescently labeled antibodies that specifically target two protein biomarkers for pancreatic cancer: glypican-1 and CD63. If these biomarkers are present, brightly colored circles where the antibodies bind can be seen under a microscope, indicating a positive result. This entire process can be done in less than an hour. So far, the team has only tested this system on a small sample set of patients. In an initial validation study on a group of 31 patients, the chip was able to flag the blood samples of 20 patients with pancreatic cancer from those of 11 patients without cancer. The team cautions that the biomarker levels screened in this study might not represent those in early stage cancer. “How small are these biomarker levels between stage 0 and stage 1 cancer? And how can we make our technology sensitive enough to detect these amounts? We’re doing more research to get a good handle on these questions,” said Heller. Next steps also include studies on a larger sample size, screening more samples from patients at various stages of cancer, and optimizing and validating this technology for early cancer detection. “A challenge in doing these studies is getting hold of early stage blood samples, when patients don’t even know they have the disease yet,” said Lewis. “Future work would entail obtaining blood samples from patients that have high risk factors for pancreatic cancer—new onset diabetes or a family history of it, smoking or obesity—and continue sampling their blood over an extended period of time. 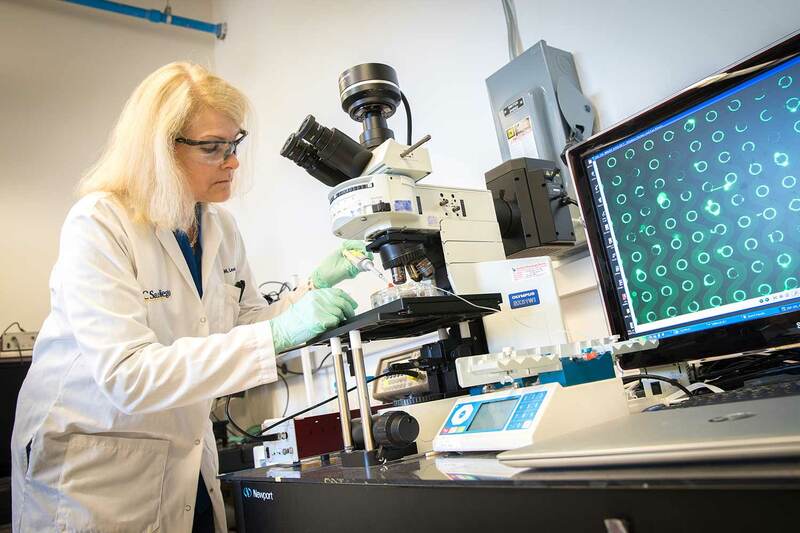 Of the patients that are subsequently diagnosed, we can go back and analyze their pre-diagnostic blood samples to see how early on we can detect cancer biomarkers,” said White. The researchers are also exploring other blood-based biomarkers—in addition to glypican-1 and CD63—to improve this system’s accuracy and sensitivity for pancreatic cancer detection. The technology for the chip-based system was initially developed by UC San Diego Jacobs School of Engineering alumnus Raj Krishnan during his bioengineering doctoral research in Heller’s lab on identifying cancer biomarkers from blood using alternating electric currents. Krishnan co-founded and is CEO of San Diego-based company Biological Dynamics, a spinout from Heller’s lab that licensed the technology in 2010. 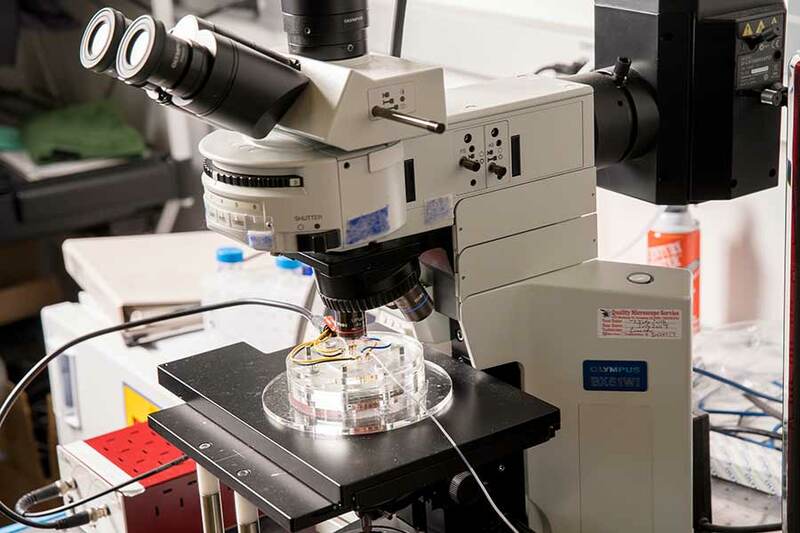 Biological Dynamics has since been developing novel diagnostic systems based on chips that use alternating electric currents to isolate nanoparticles, DNA and other molecules directly from blood and other biofluids. In the current ACS Nano paper, UC San Diego researchers used the exosome-isolating capability of Biological Dynamics technology to develop a custom assay for pancreatic cancer detection.